I’m off to Barcelona for a bit and I wanted to share with you guys all the money saving tips that I have for when I’m away. There are ways to save TONS of money by being a great online flight shopper and ways to save a bit of money (that still helps) like putting your cable and gym on hold for a month or two. Here are all the ways I’m getting ready to go to Europe and how I’m saving money in the process. Remember, any money I can save here I can spend on Sangria! Here are my tips..
1. Buying Flights: Go to your local travel agent and see if they have any great deals. Then take the same dates and go see if you can get them cheaper on line. This is the part when I have 800 windows open and I’m checking every flight for the best rate for the LOWEST amount of travel time. 2. Hotels and Flights: If you need a hotel and a flight, click the Flight and Hotel button and see if is cheaper to book both on travel sights like Expedia and Travelocity. Generally, it is cheaper than booking separately because the hotels pay some of your way and you get the fly bigger airlines that normally land in the closer airports unlike sleazyjet, etc. 3. Hotels Promo Codes: When you find your favourite boutique hotel that’s on a budget then search for promo codes for that hotel. Sometimes you’ll find one that works on their own site and you’ll save a bunch! I love staying is five stars but only paying $5 bucks! 4. Hipster Areas: When looking for a place to stay or places to party or dine, be sure to go off the beaten track. Stay in the current hipster area and EVERYTHING will be cheaper, cooler, and more genuine to that city. Those are all big things for me when I travel like a tramp. 5. Eat at Grocery Stores: I love eating local currencies when I’m away and the best way to go to the local markets and shops. Everything will be local, authentic and you can eat it overlooking whatever local scenery floats your boat. 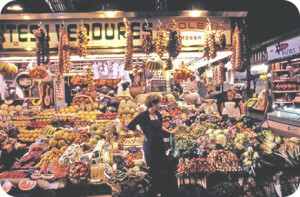 If the locals are shopping there – that is what they eat. Ask them what’s awesome. It’ll also save you a ton from restaurants three times a day. Plus, when you leave be sure to get a travel pack from your cell company. It’ll save you tons of txts, data etc. Put your gym membership, internet and cable on hold so you don’t have to pay the full amount when you’re away. Those few calls to your service providers will save you tons if you’re gone for more than a month. My next blog will be coming from Barcelona as keep checking back for more money tips!